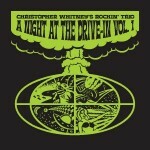 Way back in 2014 “A Night at the Drive-In, Vol 1” was the maiden foray into the vast and cluttered orbit of self produced indy pop CD’s by Columbus Ohio’s best kept secret: Christopher Whitney’s Rocking Trio. Comfortably nestled somewhere between aging cold war spy satellites and the errant fumbled wrenches of brave space station astronauts “A Night at the Drive-In, Vol 1” continues to melt the brains of anyone within earshot. A veritable cornucopia of hip rock and roll nostalgia “A Night at the Drive-In, Vol 1” is sure to satisfy the pallet of even the most bohemian of space debris collectors. At a mere five bucks, you can’t afford to not buy this CD. Sporting the traditional power trio instrumentation of drums, bass and guitar,Christopher Whitney’s Rockin’ Trio is just your typical run of the mill garagepsyche-doomfunk-postpunk-glamabilly-jamband. Like the mighty Minotaur, this Columbus, Ohio-based trio haunts a maze of nostalgia, punctuated with B-movie images of rubber monsters, hot rods and repressed teenage sexuality exploding into violence. They’ll serve you up a slice of big, dumb classic rock sensibilities baked in the oven of 70′s FM radio and drizzled with hints of Link Wray, Wanda Jackson, The Meters, Ultimate Spinach, the Cramps, Electric Wizard and just about any other ultra-hip influence you can imagine. Be the first to review “Night at the Drive-In, Vol. 1 CD” Click here to cancel reply.